How many members are in Acoustic Jass? All the instruments are acoustic (not a 13 Amp plug in sight) and Jass was the original spelling of Jazz (apparently when the bands travelled to Chicago the "J" was obliterated from the posters), others say it was a dirty word. What instruments does Acoustic Jass use? Does anyone in Acoustic Jass sing? How long has Acoustic Jass been together as a group, with their current personnel? Does Acoustic Jass always the same personnel, or do they use deputies on a regular basis? The personnel are drawn from our regular group but to cover holidays etc. use deputies from a carefully selected pool. Will it be Acoustic Jass that turns up or will it be a substitute band? They never take a booking and then provide a substitute band, what you book is what you get. What events does Acoustic Jass have experience in? 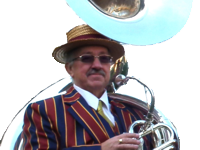 Concerts, Country fayres, corporate receptions, garden parties, jazz festivals, Christenings, dances, corporate family fun days, shop openings, New Orleans style funerals, wedding receptions, civil partnerships, students union bars. Does Acoustic Jass need electricity? No, as their name suggests they are an acoustic band and only use amplification for vocals or if the environment demands it. Can Acoustic Jass Lead our Procession? Yes, they are mobile which is why they are in demand for New Orleans style funeral processions and leading wedding parties from the ceremony to the reception. However they do limit the distance. What will Acoustic Jass wear? Their usual uniform is matching striped jackets and boaters, or matching waistcoats or matching sweatshirts depending on the weather and formality of the occasion. For colder outside events they have matching black anoraks with the classic "8 Point" American Police Cap. They also have tailcoats for the formal "White tie & Tails" evening events - 20's style. What styles of music does Acoustic Jass play? Traditional, New Orleans jazz, foot tapping music for dancing or restrained background music. All tunes have a beginning middle and an end, the sort of tunes you can whistle or hum. What sort of tunes does Acoustic Jass play? Well known jazz, blues, spirituals, ballads & popular tunes, of the early 20th century many of which were recorded at some time by Louis Armstrong, but then he recorded the best tunes of the era. How many tunes do Acoustic Jass have on their repertoire? About two hundred. Click here for a list of tunes that they play and its growing / changing all the time and, unusually for a jazz band they have some waltz's in their repertoire. Will Acoustic Jass learn any special songs for you if they're not already in their repertoire? Yes, if they fit within their type and style of music and you give them notice. If its not on their list you can always ask. 2. Cuff Billett started playing in the fifties and has a distinguished career playing and recording New Orleans style Jazz with many of the "greats". He runs his own 6 piece band New Europa Jazz Band. At the beginning of 2008 he agreed to bless Acoustic Jass with his huge repertoire of numbers. 1. Richard Cook started playing Jazz after leaving the Army in 1982. He ran his own band the Jubilee Jazzmen for ten years which included successful tours of France & Germany. He is an accomplished Alto Sax player, playing lead Alto for Maury Deans Big Band. He joined Acoustic Jass at the beginning of 2011. 1. Andy Whitaker is the latest addition to the band having played the guitar for many years he took up banjo to appear in a show and joined Acoustic Jass in 2017. 2. Dave Cummings has been playing this style of music for many years and has played with us for over fifteen years. Martin Jones spent twenty five years playing in a brass band, in 1995 he was invited to join three other musicians to form a quartet, due to the others dropping out Martin found himself left with several engagements and no band! and so Acoustic Jass was formed. In 2001 he started playing bass sax to give added colour to the rhythm section. How much space does Acoustic Jass Require? Approximately 5 square metres. They have played to an audience of 6 in someone's front room! How long does Acoustic Jass require to set up? 30 mins in a clear space & 20 mins to pack away. How long are Acoustic Jass's breaks? Can Acoustic Jass provide music during the breaks? They can provide music during breaks, given prior notice as they do not always use PA equipment. Can you request any special music during the breaks? At weddings can Acoustic Jass play outside to entertain the guests while the photographs are being taken? Yes, they are mobile and can play outside the ceremony venue (or even inside it) and could lead a procession of guests to the reception. Will Acoustic Jass be set up and ready to play when your guests arrive at the reception site, even if they are not supposed to start playing right away? Does Acoustic Jass expect to be fed? It depends on the length of the gig and time of day, however they do appreciate liquid refreshment - not necessarily alcoholic! Does Acoustic Jass accept more than one performance a day? Click here to see a Map of the area that they play in. Does Acoustic Jass have a contract? They have a basic contract/confirmation letter. Does Acoustic Jass's contract specify the individual members of the band? Not usually as all the deputies they use are to the same high standard as the members. Is Acoustic Jass willing to make additions to the contract to meet any special needs you may have? Is the equipment Acoustic Jass uses safe. Their instruments are all acoustic and therefore only powered by them. Their PA system (when used) has current PAT (portable appliance test) certificates. How much does Acoustic Jass charge for an "x" hour performance? They give a competitive individual fixed quote depending on times, day of the week, travelling distance/time etc. The more information on times, breaks and venue you give them the better the quote. Does Acoustic Jass make any other charges above and beyond the quoted price? No, their quote is fixed unless the client wishes to change the arrangements. They are not VAT registered so there is one less surprise! How much does Acoustic Jass charge for additional sets? They will give a further fixed rate for additional sets, this is also based on time of the day (before or after midnight) etc. However, in fairness to both parties this should be negotiated at the initial quote stage. What are Acoustic Jass's deposit and payment requirements? They usually take a deposit of 25% for gigs more than a month ahead, payment is on the day in cash. Does Acoustic Jass expect payment in full before the day of the event? No, they prefer cash on the night. In the unlikely event of cancellation what payment does Acoustic Jass expect. In event of cancellation any deposit may not be refunded (depending on whether we get another booking). If cancelled within 30 days of the performance date 50% of the fee becomes payable. If cancelled within 7 days of the performance date the full fee is payable.